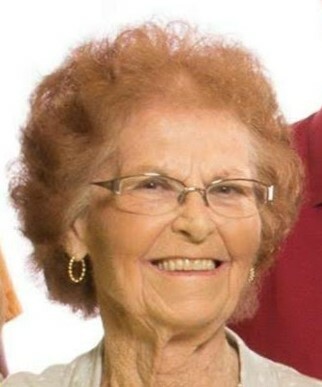 Helen “Betty” Riley, 89 of Chillicothe passed from this life on Monday, December 3, 2018 in Traditions of Chillicothe. She was born August 29, 1929 in Ross County, the daughter of Howard and Rena Belle (Minney) Shoemaker. On February 2, 1948 she married William “Bill” Riley who survives. Also surviving are daughters, Vickie (Jeff) Rickey and Kim (Joe) Litter, all of Chillicothe; grandchildren, Josh (Roslyn) Varnado, Maggie (Nathan) Barker and Riley (Drew) Bobb; great-grandchildren, Leah and Audrey Varnado and Remington and Colt Barker; half-sisters, Sue (Walt) Mitchell and Janet Franklin; half-brother, Ernest Shoemaker and a host of extended family and friends. She was preceded in death by her parents, sisters, Louise (Phil) Shoults and Marge (Walt) Immell and several sisters-in-law and brothers-in-law. Mrs. Riley was an employee of the Ross County Jobs and Family Services, retiring in 1990. She attended Centerpoint Church. Funeral services will be held at 1:00 pm on Saturday, December 8, 2018 in the FAWCETT OLIVER GLASS AND PALMER FUNERAL HOME with Pastor Lou Watson officiating. Burial will follow in Twin Township Cemetery. The family will receive friends at the funeral home from 11:00 am until the hour of service on Saturday. Memorial contributions in Betty’s memory may be made to the Chillicothe Cavalier Club, 326 Fairway Ave., Chillicothe, OH 45601.